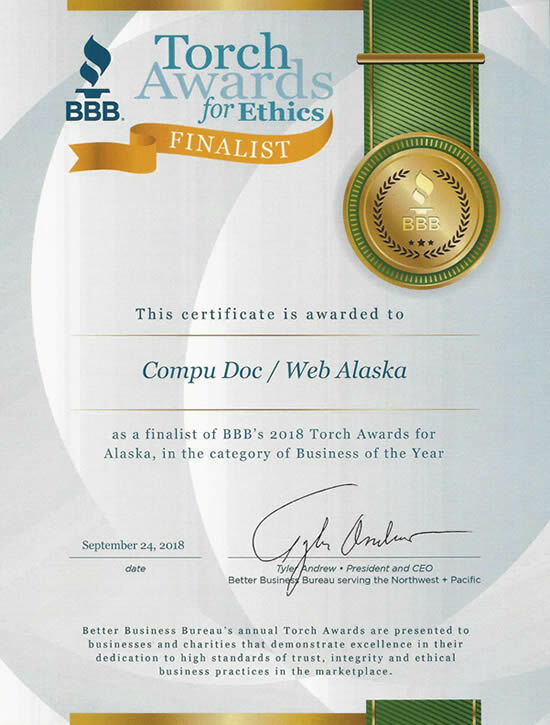 Web Alaska & Compu Doc have been providing a wide range of computer services to businesses and individuals throughout the world since its inception in 1994. Proudly Alaskan owned and operated, Web Alaska and Compu Doc provides true personal service to each and every customer, ensuring their complete satisfaction. From web hosting to web site design, Web Alaska is always a sure bet. With its very attractive rates, and superb technical expertise, it takes the burden of conception, construction and maintenance from your shoulders - freeing you to devote your time to your customers. Compu Doc provides a wide range of computer maintenance services to residents of South-Central Alaska to keep their computers operating at peak efficiency. Installation and maintenance of hardware and software, networking and virus removal, Compu Doc does it all. The expert assistance of Web Alaska and Compu Doc for your residence or business is just a click away - so don't delay - get the help you need today. I usually dont put things like this on my front page but there is a time and place for everything. My store bought diet is limited. Fish and Game are important to Alaskans like myself just as they are to more rural and off the road system Alaskans. DEFEND ALASKAN FOOD is a national effort dedicated to educating people regarding the importance of wildlife to the culture and diet of Alaskans.